Prawn noodle is a soup based dish. 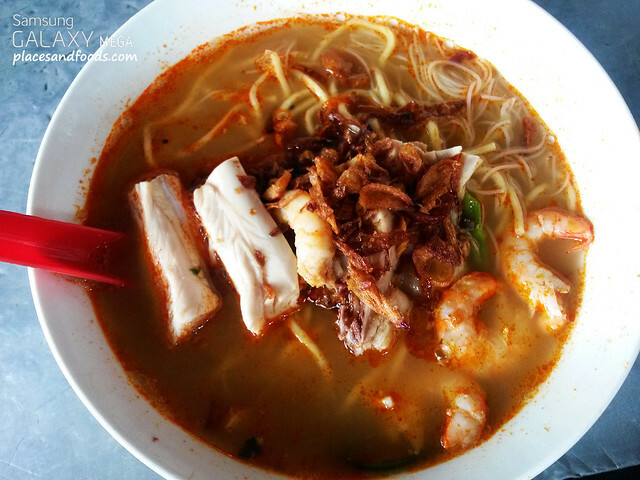 In Penang you called it Hokkien noodle, in KL you called it prawn mee or noodle. KL’s version of prawn noodle uses mee hoon or rice vermicelli. Mee hoon are thin rice noodles and extremely popular with locals and this part of the world. The beauty of prawn noodle is its broth. Broth is cooked for hours using prawns and their secret recipe. You can immediately smell the fragrant of the soup when they poured the broth into the bowl of either noodle or meehoon or both with sliced cooked prawns and water spinach (kangkung) and compliments with chili sauce. Most version of the prawn noodle comes with boiled egg and either sliced fish cake or sliced chicken meat. It is getting tougher to find prawn noodles in many food courts due to the rising cost of the main ingredient, prawns. However, there are still popular specialty stalls around KL. 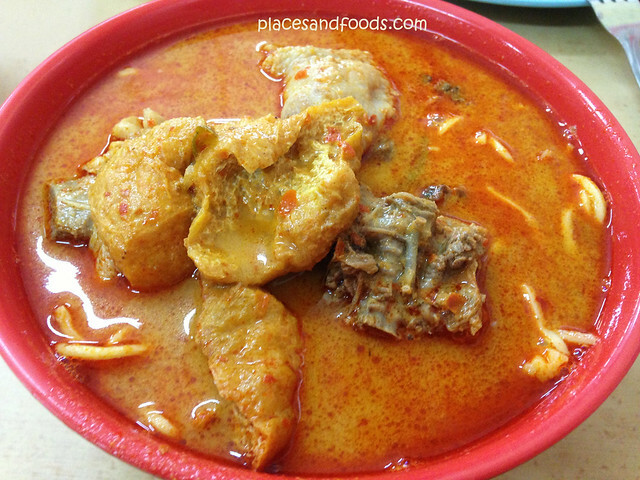 Curry mee is uniquely originated from Malaysia (and now claimed by Singapore) is a local favourite. Curry mee uses yellow noodle with sliced chicken, beansprouts, taufupok (dried tofu), long beans and cockles. Some comes with prawns, cuttlefish, egg, char siew, fried pork, pig’s skin, pig’s blood (in cubes) and mint leaves. KL’s version usually comes without the pig’s blood as they are common in Penang. There is no fixed ingredients for curry noodle in KL as I’ve seen comes with char siew or fried pork but most of them has beansprouts, taufupok, long beans and cockles. How good it tastes goes down to the curry itself. Get your towels ready as you will sweat like a pig when you have curry mee during a hot day. Some will add “sambal” (chili paste) to intensify the spiciness for the “kick” and I usually enjoys the mild spiciness curry. Cockles are usually half cooked with slight pink on its texture. Curry mee is easily available in many coffee shops, food courts/outlets and local franchise restaurants such as Old Town, Kluang Station, Papa Rich and many more.